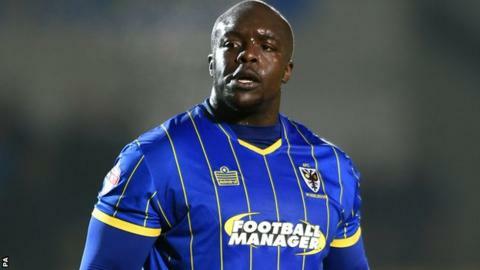 Adebayo Akinfenwa's header helped Wimbledon claim a deserved draw away at Yeovil. Home keeper Artur Krysiak superbly denied George Francomb and Tom Elliott as the away side began brightly. Omar Sowunmi's flick-on found Ryan Bird who fired in from close range to give the home side the lead. The visitors continued to press and were rewarded 10 minutes from time when Akinfenwa headed home Francomb's corner to share the points. "Last week it was frustration with the man in the middle, today it's frustration because we were the better team and we should have won the game. "I thought today we were exceptional - in general the chances we created I think we probably should have scored four today. "I'm proud of the boys, the performance levels were exceptional and I'm really pleased for the fans because it would have been sad for everyone involved in the club to come home disappointed today after such a good performance." Match ends, Yeovil Town 1, AFC Wimbledon 1. Second Half ends, Yeovil Town 1, AFC Wimbledon 1. Attempt missed. Adebayo Azeez (AFC Wimbledon) left footed shot from the right side of the six yard box is close, but misses to the right. Substitution, Yeovil Town. Jordan Gibbons replaces Jake Howells. Attempt missed. Paul Robinson (AFC Wimbledon) header from the centre of the box is close, but misses to the right. Corner, AFC Wimbledon. Conceded by Artur Krysiak. Attempt saved. Dannie Bulman (AFC Wimbledon) right footed shot from the centre of the box is saved in the centre of the goal. Attempt missed. Adebayo Azeez (AFC Wimbledon) right footed shot from outside the box is just a bit too high. Attempt missed. Mark Beck (Yeovil Town) header from the centre of the box is close, but misses to the left following a set piece situation. Jake Howells (Yeovil Town) wins a free kick on the left wing. Goal! Yeovil Town 1, AFC Wimbledon 1. Adebayo Akinfenwa (AFC Wimbledon) header from very close range to the bottom right corner. Assisted by George Francomb with a cross following a corner. Attempt missed. George Francomb (AFC Wimbledon) right footed shot from outside the box is close, but misses to the left from a direct free kick. Adebayo Azeez (AFC Wimbledon) wins a free kick in the attacking half. Attempt missed. Jake Reeves (AFC Wimbledon) right footed shot from the right side of the box misses to the right. Corner, Yeovil Town. Conceded by Jake Reeves. Mark Beck (Yeovil Town) wins a free kick in the attacking half. Attempt missed. Paul Robinson (AFC Wimbledon) right footed shot from the centre of the box is too high following a corner. Corner, AFC Wimbledon. Conceded by Nathan Smith. Corner, AFC Wimbledon. Conceded by Matthew Dolan. Paul Robinson (AFC Wimbledon) hits the bar with a header from the centre of the box following a corner. Substitution, Yeovil Town. Mark Beck replaces Omar Sowunmi because of an injury. Will Nightingale (AFC Wimbledon) is shown the yellow card for a bad foul.